Original Oil Painting 30" x 40"
The First Soars Into the Next Century is available as a Limited Edition reproduction lithographic print issued in 2013 by the artist Kristin Hill to be an edition of 366 prints, signed and numbered by the artist in pencil, with the painting image measuring 18” x 24” placed within a surrounding border and printed on acid free paper. The Artist Proof Edition consists of 36 prints of the same description. The sole copyright and rights of reproduction are retained by the artist Kristin Hill © 2013. The Limited Edition of 366 prints is available through the Beale Liaison Group in support of the 1st Reconnaissance Squadron. 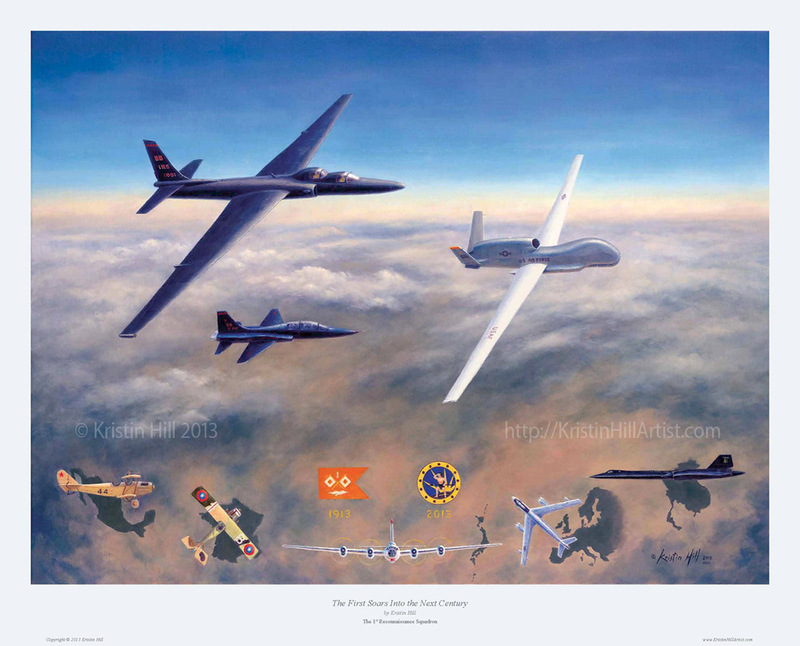 In recognition of dedicated surveillance coverage and the statement “a U-2 in the sky every minute of every day” the Limited Edition consists of 366 prints. Of these 366 prints, the final 24 prints display an additional special numbering sequence of 1 through 24 over the number 24/7. The final print of the edition is 366 of 366 and 24 of 24/7. All other print numbers are $75 each with a special 1RS Centennial Event discount price of $50 each through March 8, 2013. Artist Proof Edition of 36 prints my be purchased from Kristin Hill, for more information please contact Kristin at Kristin@KristinHillArtist.com. Copyright © Kristin Hill 2013, article content and images may not be reproduced in any way.